Solid green bars for Pehota's winning run. Logan Pehota stole the show at today’s Freeride World Tour event at Kicking Horse Mountain Resort in British Columbia, Canada, flashing the contest venue with speed and style and stomping one of the biggest airs of the day on his way to a high score of 98.00—one of the highest scores on the Tour in recent memory. Tensions were high coming into this tour stop after last month’s underwhelming 2018 Freeride World Tour season kickoff in Hakuba, Japan, where organizers were forced to cancel the contest due to hazardous conditions. Thankfully the weather gods stepped up to the task at the tour’s second stop in Kicking Horse, B.C., providing sunny conditions dimmed only slightly by occasional wisps of cloud, and a fresh 30 to 40 centimeters of Canadian white gold. This was the first top-level FWT tour stop at Kicking Horse, a Canadian Rockies resort that’s already well-known for its great snow, terrain, and history of freeride contests like the fabled “Wrangle the Chute.” After a few years of hosting Freeride World Qualifier events of increasing stature, in 2018 Kicking Horse was ready to host a full-fledged tour stop—and provide this host did, with a contest venue called “Ozone” that’s normally a permanently closed area, featuring both playful and technical sections and near-optimal snow conditions. Pehota, a native of British Columbia and son of big-mountain ski pioneer Eric Pehota, kicked off his run with a clean 360 off a top cornice, followed by fast, technical skiing through the middle section. Coming into a rocky, skied-out steep section at the bottom, Pehota went for glory, straightlining through the rocks to punch straight off one of the biggest cliffs on the venue, and stomping the landing. 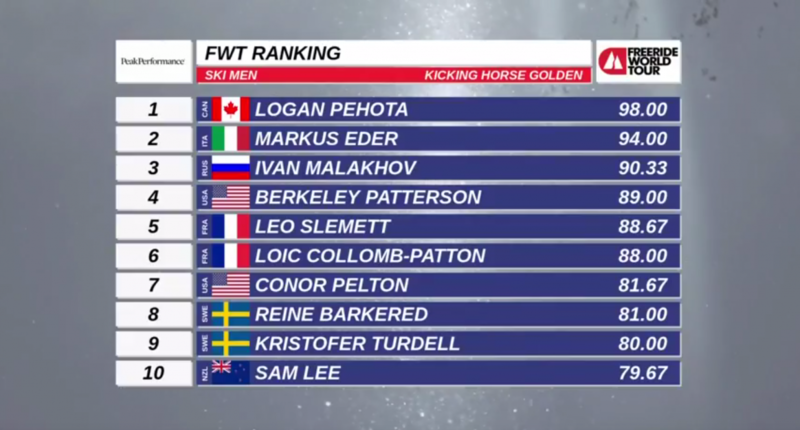 Pehota’s massive score of 98 comes in a good three points higher than any of the winning runs on last year’s tour, and longtime freeride professional and FWT commentator Martin “McFly” Winkler called it the highest-scoring run he could remember. Pehota was followed on the podium by Italian Markus Eder, who held the top score for much of the contest with the help of a massive, clean 360 off an untracked hit in the bottom section, and Russian Ivan Malakhov, who went full-send mode off a top-section cliff to a flat landing, stomping effortlessly before flashing the rest of the venue. On the women’s side, Austrian Eva Walkner took the win with a creative line choice that kept her skiing untracked powder for most of her run, linking clean cliff drops and a technical straightline at the bottom for a high score of 86. 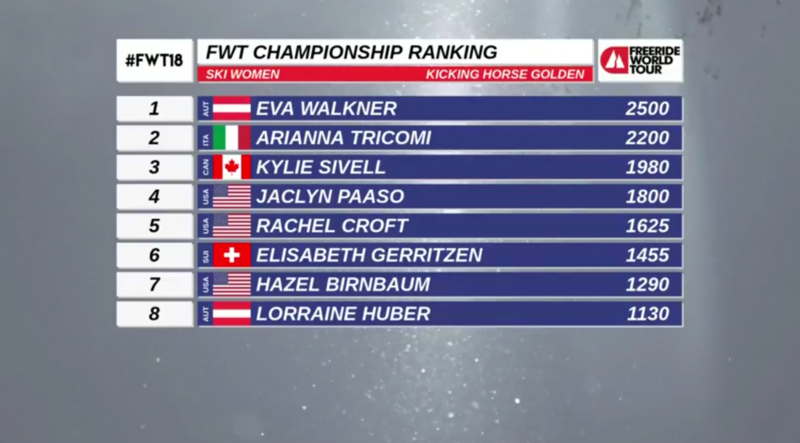 Dropping right after Walkner, Arianna Tricomi of Italy snagged second place with a score of 81, skiing hard and fast through the top section and lining up a big drop at the bottom. Canadian Kylie Sivell, whose run we weren’t able to watch due to a livestream glitch, took the third podium spot. Though this is a skiing website, some shoutouts are due to our one-planking friends as well—namely Alaskan Davey Baird, who in serious “keeping it real” fashion reportedly eschewed comfortable hotel lodgings in favor of his RV in the Kicking Horse parking lot for the past week, and took the win on the snowboard men’s side; and Austria’s Manuela Mandl, who rode to a clean win among the women snowboarders. That’s a wrap on the Freeride World Tour in Kicking Horse, at least for now—organizers are now looking into the option of restaging the cancelled Japan tour stop later this week here. We’ll keep you updated with more information as it becomes available.